Upgraded football facilities that rivals any in the country. Stellar recruiting class every year. Three straight ACC Championships, three straight college football playoff’s, National Championship. Dabo has defeated Urban Meyer twice, Bob Stoops twice, Nick Saban, Les Miles and Jimbo Fisher has given up on Florida State. Plus Ohio State is 0-3 vs Clemson. The CFP committee told Urban Meyer there was less competition with West Coast teams. He didn't want to face Clemson again. Does anyone remember the won-loss record for all games between Ohio State and Clemson? I’d rather have the opportunity for a National Championship, than that guaranteed victory Urban Meyer took. Less anxiety than trying to explain another loss to Clemson. Like Auburn's guaranteed victory over UCF? Like Michigan's guaranteed victory over SC? Are you suggesting that when Alabama defeats Georgia that UCF will be the National Champions? Any scrub can defeat Michigan, Ohio State proved that. Iowa would be proud. Urban knew he had less chance of an anxiety attack with a West Coast team. 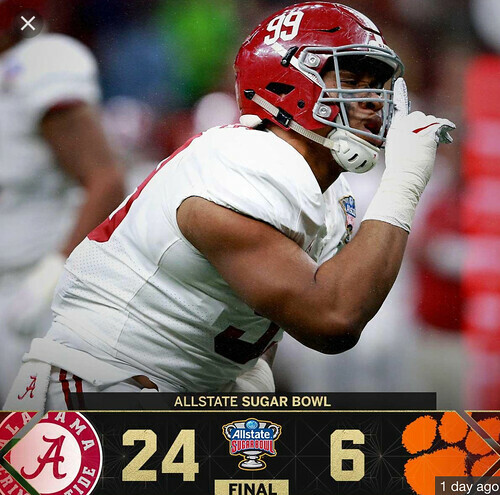 [quote=“1 CAT FAN”]Are you suggesting that when Alabama defeats Georgia that UCF will be the National Champions? I imagine you lost a lot of money bets thinking like that. I wish I knew you personally so I could pick your pocket. Clemson was way overrated this year. Syracuse exposed them for the phony they were. At least the betting line knew they were overrated and were an underdog against Alabama, regardless of their fake #1 standing in the playoffs.